Leafy greens are loaded with phytonutrients, protein, vitamins, antioxidants and are an wonderful addition to your daily diet. Yet it is worth noting that all raw leafy greens carry a small amount of toxins, known as alkaloids, that protect plants from being entirely consumed by other animals and wiping out the plant species. As humans, if we consume these toxins for long periods of time, they can build up and create health issues. Some symptoms of alkaloid buildup are nausea, tingling in fingertips and fatigue. The goitrogens in kale and other brassicas has been shown to interfere with thyroid hormone function in susceptible individuals. While the oxalic acid in spinach can be problematic for people who are prone specifically to oxalate kidney stone formation. Consuming a couple handfuls of spinach or kale every day is perfectly safe for most healthy people who do not have a pre-existing health condition that could be aggravated by these foods. It his HIGHLY unlikely that you will experience any sort of toxicity from eating larger-than-average portions of leafy greens as part of a healthy, whole foods diet. 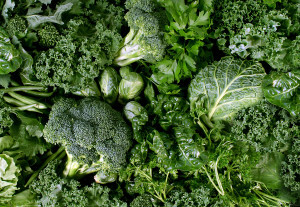 The easiest way to ensure your green intake is abundant and healthy is to simply rotate your greens. Throughout the week, use a variety of leafy greens in your diet to ensure that your body is not relying only one source of greens and that you are taking advantage of the nutrients available in the various varieties of greens available throughout the year. Great advice. This is something that no everyone who promotes green smoothies teaches, and it is vital advice. Thanks for getting this out there as it is really important information. y from eating larger-than-average portions of leafy greens as part of a healthy, whole foods diet.